Sometimes your correspondents using Outlook send you an email with a winmail.dat file attachment. If you do not use the Microsoft email client, it is impossible for you to open the attached files contained in the email. We will see how to fix this problem. When sending an email with attachments from Outlook to a correspondent using another email client, such as Thunderbird , it may not be possible to read these attachments. Indeed, in the case where the messages are in Microsoft Exchange RTF format (for example, with text in bold or in italics), Outlook encapsulates these elements in a winmail.dat file . The correspondent not using Outlook will then be unable to open, read or save the files contained in this archive. On the Tools menu , click Options . On the Mail Format tab , under Message Format , select HTML or Plain Text in the Message Format list . 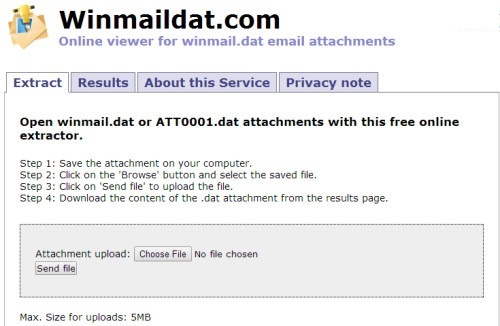 Another way is to edit your contact’s file that receives your attachments as a winmail.dat file. In the General Email Address tab , right-click and choose Properties . In the Mail Properties window , go to Internet Format and check ” Let Outlook decide the best sending format “. Validate and save. Thus, your correspondent will receive your attachments correctly. To read the contents of the winmail.dat file, we will use the free software Winmail.dat Reader . After installing and running the program, just click on the Open winmail.dat button and go to your winmail.datfile, which you will have saved on your disk. Then, the software simply allows you to view the documents contained in the encapsulator. You can open them directly by double clicking on them or save them by clicking the Save As or Save All button . You will be able to consult the attached files contained in the winmail.dat file that have been sent by your correspondent.